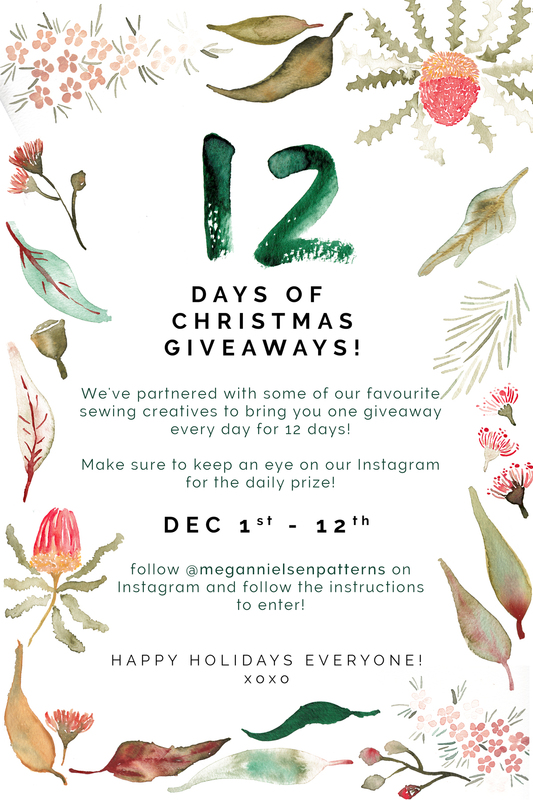 Giveaway // 12 Days of Christmas! Where on earth has this year gone?! I can’t believe it’s almost December already, but we all know what that means…the wonderful food, family and love filled Holiday season is here! To say a great big thank you for all of your wonderful support this year, we’ve got a little surprise coming for all of you on Instagram on the 1st of December! We’re having 12 Days of Christmas giveaways!! Starting December 1st and running until December 12th we will have one incredible giveaway per day via our Instagram! We can’t reveal the exact prizes (you’ll have to keep a watch on Instagram for that!) but we can say that for some we’ve partnered with a few of our favourite sewing creatives to put together 12 incredible offers just for you, our wonderful, amazing, fave people! All you have to do to be in the running is make sure you’re following @megannielsenpatterns on Instagram (maybe even turn on notifications so you don’t miss out on seeing the post! ); follow the rules posted on each giveaway image and we’ll let each daily winner know the following day! Don’t worry we’ll send you a direct message so we can organise where to send your special Christmas gift!